Whether your vineyard has been around for thousands of years or if you’re a start-up winery, to be successful, your business must have an online presence via social media or through its own website. To be competitive in the professional e-commerce market, websites must look professional and be a highly responsive design. However, it’s easier and just as effective, to use a pre-designed responsive WordPress theme with custom widgets. The best WordPress themes for wineries will not only establish one’s online presence, but also assist in the marketing and branding of a winemaker, seller, or vintner. For the winemakers that take pride in their craft and offer a superior product, Momamia is the best WordPress responsive theme for wineries that reflect those Mediterranean vineyards. Visitors, to the Momamia theme WordPress site, are greeted by borders of grape leaves and backdrops of soothing sunsets. It offers a beautifully designed e-market to showcase products, wines, and anything else your winery sells, as well as showing guests the warm-hearted nature of your business. The Momamia WordPress theme is perfect for Napa Valley wineries and family-owned vineyards. Designed specifically for vineyards, wineries, wine tour services, and anything wine related Momamia offers a relaxing, soft-toned aesthetic design. The variable color palette and fonts are styled toward the Mediterranean brand images. Greek, Italian, and French wineries are served best by Momamia. Visitors are wrapped in a romantic oasis, upon on arriving at the home page, and are able to browse the sites wine collections or join a wine club, all from the landing page. 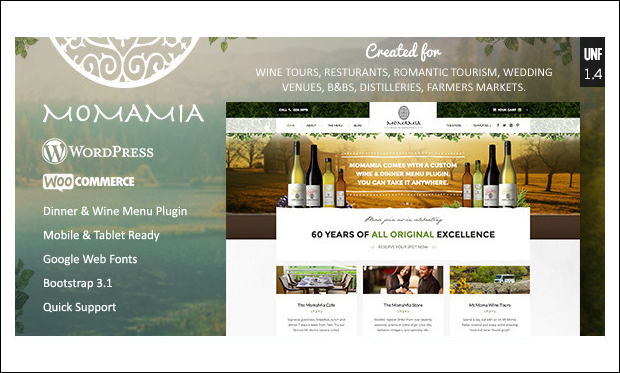 Winery owners and marketing officials will love the responsiveness of the Momamia WordPress theme. It has been built on Twitter Bootstrap 3.1 and has been designed for full usability with WooCommerce. Featuring a drag and drop editor tool, and over 90 available back end customization options, there is plenty of room to create the perfect WordPress website for your winery. 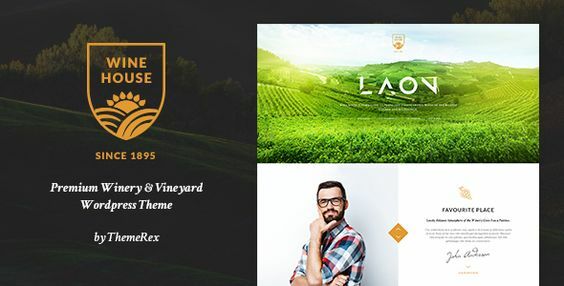 Including all of the necessary tools for an e-commerce platform, Wine House is an all-inclusive winery WordPress theme. It offers the user a great amount of variability in design features and will impress an air of refinement to all who visit. From the smooth graphics to the cursive script fonts, Wine House is a great WordPress theme for wineries. With a modern and elegant design and a clean angled template, Wine House is perfect for Wineries that take pride in their offerings. The Wine House WordPress theme allows users to customize the homepage to showcase whatever element is of paramount importance to the marketing. The theme is designed as an e-commerce platform, as well as an introductory business page. 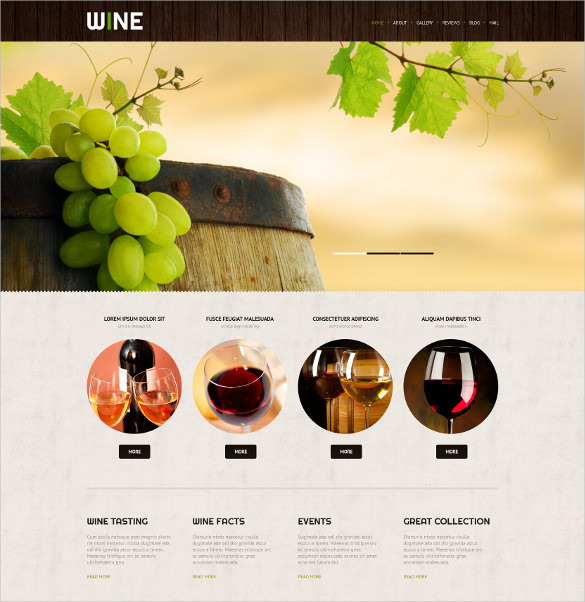 Wine House is the best WordPress theme for high-end wineries and wine subscriptions. Wine House has been engineered from the ground up to be completely compatible across all viewing devices. Visitors can rate their favorite wines and book a reservation to visit the winery, all from the integrated booking system. The Visual Composer allows for creating a personalized, beautiful image gallery. Wine House features a premium Slider Revolution plugin, front end drag and drop page builder and an integrated SEO performance optimizer. Wine House is perfect for wineries who want to expand their online viewership. As smooth as it is classy, Villenoir Wines WordPress theme is a stand alone, as the best WordPress theme for wineries, overall. No matter the quality of your product or the shape of your business, Villenoir Wines will impress the utmost quality upon your site’s visitors. Bathed in classic black and cream, everything about Villenoir Wines inspires a feeling of satisfaction found in a great bottle of wine. Villenoir Wines was formatted, conceptualized, and designed exclusively for winemakers, wineries, and wine merchants. Certainly aimed towards a higher income bracket clientele, this theme is well received by a sophisticated viewer base. Villenoir Wines WordPress theme features a minimalistic, subtle interface, which viewers will experience as containing much more than meets the eye. Like a good bottle of wine, the best notes are hidden. 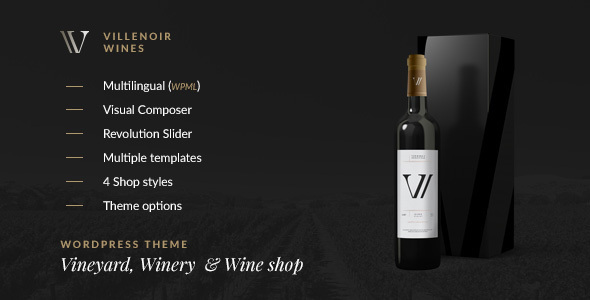 Integrated for WooCommerce, and an 1170 px wide template, users and visitors alike will have no trouble navigating Villenoir Wines theme. Visitors can view the inventory of wine, browse the featured winery images, or sign up for a wine club membership—all with no extra back end work on the part of the administrator. Villenoir Wines comes completely integrated to put your winery on the top of the search engine, with its SEO optimized, translator ready WordPress theme. 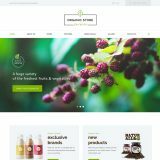 With 4 shop template designs and a variety of customizable widgets, it is highly recommended as the best WordPress theme for wineries, overall. Wonderfully formatted for wine merchants of all kinds, Vineyard WordPress theme offers a versatile platform for wineries. Though the theme is purposed for wineries and wine merchants, Vineyard can be utilized by merchants from many industries; however, it shines brightest when showcasing high-resolution images of the best labels of wine. 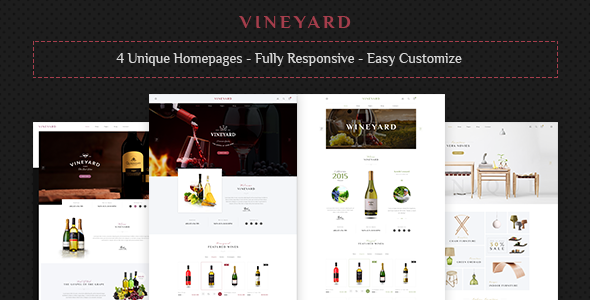 Vineyard is the best multi-purpose WordPress theme for wineries. Vineyard has been designed around a WooCommerce plugin, so users will have no trouble setting up their e-marketplace for sales. It is compatible and optimized for all mobile viewing devices and is retina-ready. Vineyard is programmed to increase a merchant’s online revenue and web traffic with its integrated SEO optimization feature, which improves your presence on search engine hits, bringing viewers to your site. Administrators can promote monthly wine club memberships, single bottles, and winery tours all from this fully integrated WordPress theme. Winery content administrators have the choice of four different Vineyard theme templates. 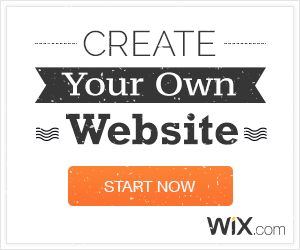 Within these templates, all features, buttons, tools, and colors are completely customizable and integrate a drag and drop page builder. The interface, both for visitors and administrators, is intuitive and smooth, thanks to the careful design and extensive short coding. Vineyard is a great theme for wineries that appeal to a wide audience. Bringing viewers onto the land of an Italian or California winery is what it feels like to land on the Wise Mountain homepage. Wise Mountain is, perhaps, the best WordPress theme for wineries that are on their feet, but not yet running. On the other hand, Wise Mountain is a beautiful winery theme for a top-rated, small-batch vineyard that doesn’t want to visually boast of their success. Regardless, Wise Mountain creates a down-home, invitingly ancient atmosphere for viewers and can be great for wineries and vineyards of all styles. Wise Mountain does not try to win over visitors with cheap tricks. The aesthetic is simple, tasteful, and clean. Designed for businesses who want to wade through the chaff, Wise Mountain is nothing but wheat. 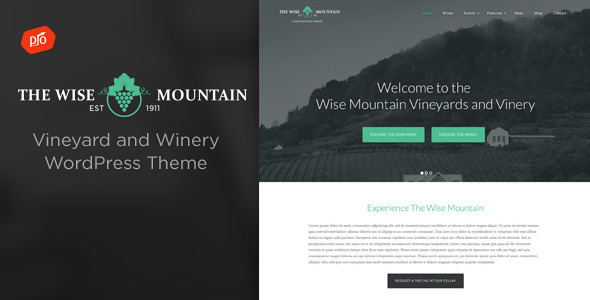 Visitors to the Wise Mountain WordPress theme will leave with the impression of having just experienced a piece of one of the most sophisticated wineries in the world. From its wine tour page to its wine members club, Wise Mountain is best for wineries who aim to brand themselves as exclusive. In Keeping with the stripped down aesthetic, Wise Mountain offers the website developer intuitive customization options. The Wise Mountain WordPress theme is easy to use, both for visitors and developers. It supports flash animations through jQuery and is fully WooCommerce supported. The front end and back end, there is no learning curve to grapple with for users and it comes with all the goodies like SEO optimization, Slider Bar plugins, and retina support. Wise Mountain is a wise choice for sophisticated winemakers and vineyards. Scrupulous viewers will notice acute similarities between the WineShop WordPress theme and the Wine House WordPress theme. 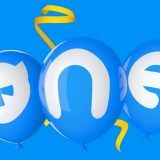 Both themes are created by the same developers and are intended for users in the wine industry. However, whereas Wine House is designed for physical vineyards and winemakers, WineShop is one of the best WordPress themes for online wine sellers and merchant vintners. WineShop is designed around a WooCommerce functionality, making it ideal for online wine vendors. 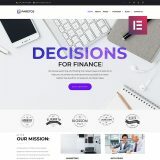 The theme is designed with four homepage templates, which range in aesthetic from the down-to-earth to high-class chique. Wineries can choose to layout their site purely as a showcase for their product or they can integrate as much graphic content, text, and personality into the layout as they desired. WineShop is formatted with retina support, SEO optimization, and numerous drag-and-drop widgets and tools for customizing the perfect winery merchant web page on WordPress. Of course, the makers of the WineShop WordPress theme have outfitted it with all of the essential user interface plugins, such as Visual Composer, front end building plugins, and Slide Revolution. WineShop has every tool necessary to build, market, and maintain a fully functional online winery store. 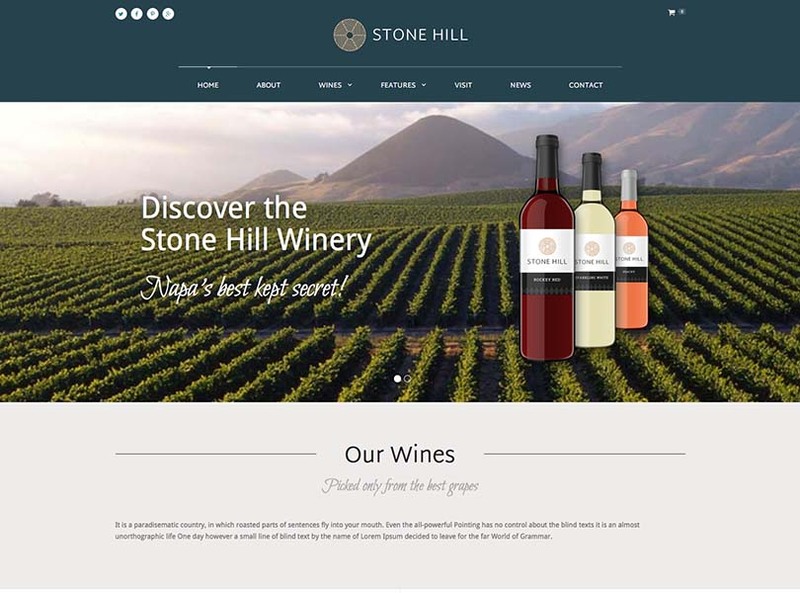 Truly a beautiful winery theme for WordPress, Stone Hill confers all the earthly glow of a vineyard in full bloom, while exhibiting a minimalist demure of modern class. Stone Hill is the best WordPress theme for wineries that cater to an educated, urban demographic. Arriving on the homepage brings viewers back to their earliest memories of wine and what makes each individual wineries vintage uniquely cherishable. Stone Hill has been delicately designed to host its visitors with grace. A simple, clean layout compliments the fit style font, making each layer of content more inviting than the last. Stone Hill exudes sophistication and does not hinge on heavy video content or animated graphics. Every visitor that visits the Stone Hill WordPress theme can instantly identify and access their content of choice. It resembles a stone cottage house upon the woodland prairie, opposed to a steam-punk converted warehouse that overlooks a metropolis. Stone Hill is designed to be user-friendly and wholly effective. Administrative users of the Stone Hill WordPress theme are benefited by the usual lineup of integrated shortcodes, such as Visual Composer, Mega Menus, Slider Revolution, and Slideshows. In addition, the full SEO optimization feature works to maximize the sites online viewership, which, for the best wineries, results in maximized revenue. White Rock is the best WordPress theme for professional wineries that are new to building a WordPress website. It lacks some of the bells and whistles that are integrated into the more complex WordPress winery themes but is makes up for it with its incredibly easy site builder. White Rock provides a pristine aesthetic for a wineries online marketplace and does not sacrifice any of the essential e-commerce functionality features. White Rock is recommended for WordPress beginners and those who don’t want to spend much time in the little details of their website. For those who want the ability to publish a great looking winery website quickly with unlimited color pallet customization, White Rock is designed as the best quick-and-perfect WordPress theme for wineries on the market. 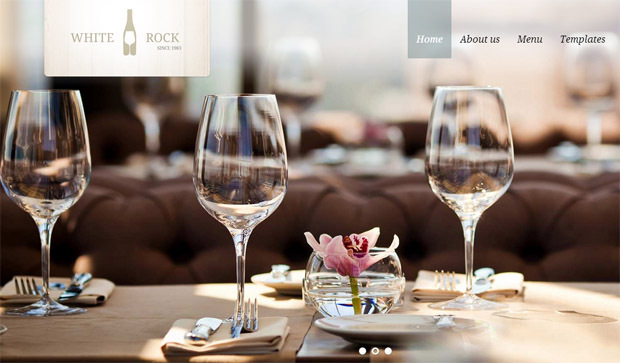 Its simple user interface and ease of use have made White Rock one of the best selling WordPress themes for wineries online. Even with so many duplicates of the White Rock theme, it is still designed with enough customizable content to give each wineries website a firm individuality. White Rock administrative users are benefited by a fully responsive retina-ready platform, which includes premade layout templates. Simple, clean and easy, White Rock makes building your WordPress website nearly effortless. The White Rock theme includes video documentation and demo content, making it the most usable WordPress theme for wineries overall. Good Ol’ Wine creates an active, engaging experience for the visitors. 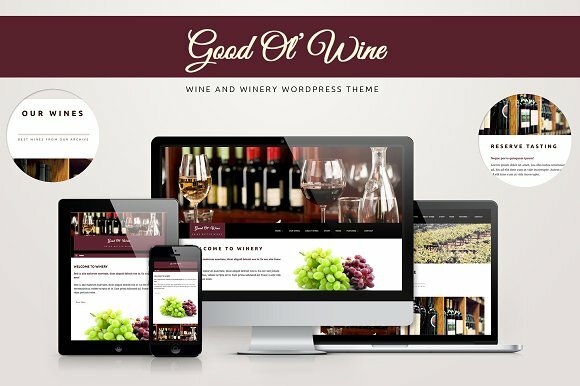 Great for wine enthusiasts, wineries, wine sellers, and winemakers, Good Ol’ Wine theme is the best WordPress Theme for wineries that cater to a younger demographic. Crisp, sharp graphical content and clean sliders make for a sweet ride through the vineyard of this WordPress theme. Designed around a WooCommerce platform, Good Ol’ Wine is great for an online storefront or maximizing a winery’s online viewership. It is designed to be as much of an informative wine enthusiasts guide, as it is to be a place of commerce. Wineries can market their wines, as well as scheduled tours for their physical location. One of the easiest WordPress themes for wineries to customize, Good Ol’ Wine is perfect for giving your winery’s website an individually elegant flare. The built-in Theme Customizer and color picker gives the design administrator complete control over the aesthetic message that viewers feel on arrival. Highly animated and beautiful, Good Ol’ Wine will be a great addition to your winery’s brand image. A fully functional, versatile, and customizable platform for wine sellers and stores, Wine is a great WordPress theme for wineries that handle a high volume of sales. It is a responsive, e-commerce-based WordPress theme, which looks great on any viewing device and includes all the tools a winery needs to get their website up and going. Though the aesthetic is a bit more generic, it outdoes itself in customization and pre-made templates, which is great for hands-off site builders. Designed around WooCommerce, Wine can get an e-wine store running in no time and with low maintenance. With over 30 templates and full customization, the design of your Wine landing page is only limited by one’s own imagination. Though this theme is great for hands off users, the hands-on users won’t be disappointed. Users can choose between 5 different homepage templates, all of which are easy on the eyes and fully supported. Thanks to the integrated shortcode features and plugins like Visual Composer, Wine is an effortlessly usable WordPress theme for beginners and advanced site builders alike. With a highly controllable front end appearance and extensive theme options, Wine is one of the most overall versatile winery themes for WordPress. Agritourismo Wine is a highly visual theme, designed to capture the viewer’s attention. This theme falls on the opposite end of the spectrum from some of the simple, elegant themes previously discussed. Agritourism aims to wrap visitors in a stimulating, rich color pallet, with many moving animations and icons. Visual Composer makes the extensive customization features much easier and quicker. Users benefit from a fully responsive and WooCommerce integrated platform, as well as premium plugins. Administrators can design a personalized layout and integrate widgets and tools, such as wine club membership banners and monthly vintage sales. 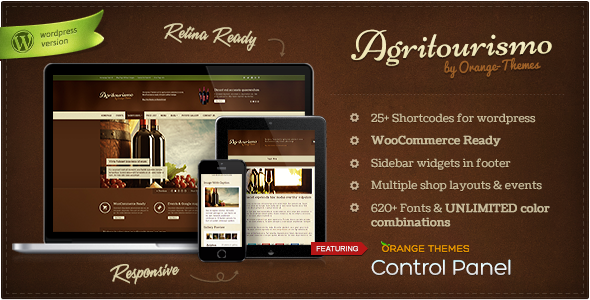 Agritourismo Wine theme might be a little too much to handle for some WordPress novices; however, it presents a plethora of options for the savvy and able winery. 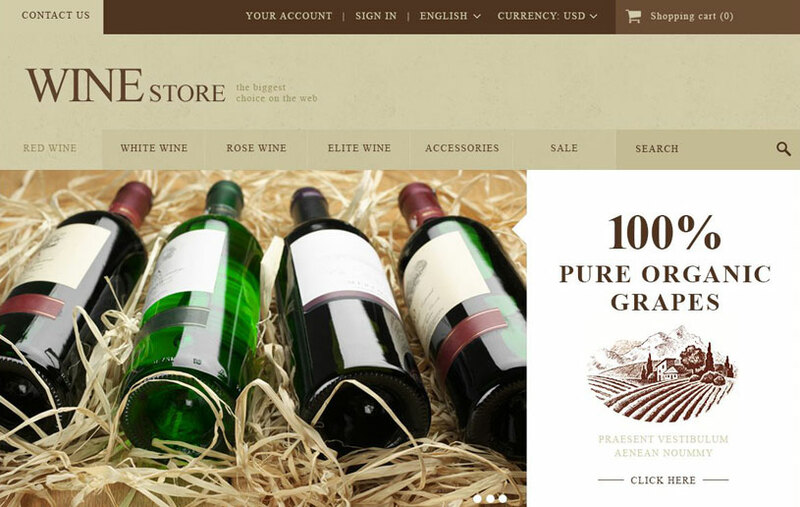 As the name may suggest, WineStore is a great WordPress theme for wineries that target a general demographic and seek to increase their e-commerce-based stream of revenue. WineStore offers all of the necessary features and makes up a platform that is perfect for a laid-back audience. The fun-loving fonts and crisp animation create a energized experience for visitors of your winery’s WordPress website. WineStore is designed with all of the wonderful little features that keep a viewer’s attention. 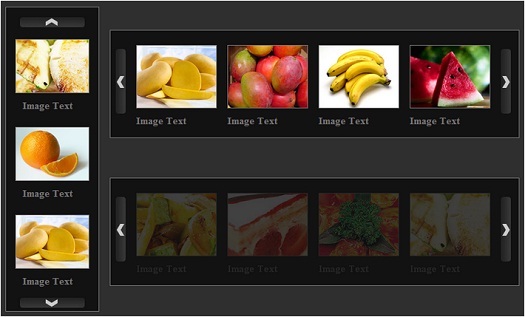 A white background highlights the animated wine bottles and scrolling image banners that adorn the header and footer. Wonderfully simplistic in the most pleasing way, WineShop gives visitors an on-the-level handshake, which makes for a trustworthy merchant relationship. WineShop is easy to use thanks to the integrated usability plugins, widgets, and tools. These include Revolution Slider, QuickShop, Product Color Filter, Slider plugins and more. The platform is created around WooCommerce and makes for a seamless point of sale experience for both the merchant and the customer. With the integrated SEO optimizer and the ability to feature wine club banners and member sign-ups, wineries can expect an increase in their online patronage. 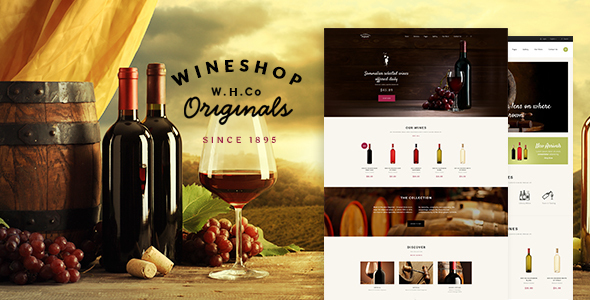 WineShop is a great choice for a general-purpose winery WordPress website theme.